I love the Holiday season. It gives me a reason to create yummy recipes to share with my family and friends instead of having them all hang around my house packing the pounds on me. I added yummy pumpkin ingredients to make these rice marshmallow treats a little more festival for the Fall season! I think these rice crispy treats for Thanksgiving will be perfect? Do you like Pumpkin flavored dishes? Which ones are your favorite? Those are the fanciest treats I have ever seen, you put my odd shaped bars to shame. Now I have a question, why did no one ever tell me to butter my spoon to keep from sticking? Seriously, you might be a genius! now THAT is a thanksgiving edible craft I can get into! I love the added almonds and fruit. 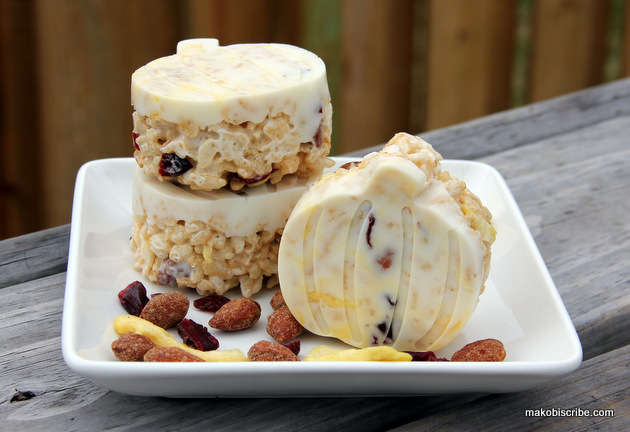 I never would have thought to add those to rice crispy treats! It just made it so much better! Those look fantastic! I love craisins. These are so cute! I wonder if I can make a vegetarian version for my family. I think the kids would LOVE making them.